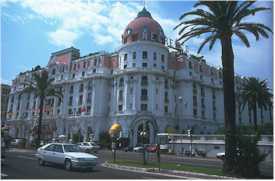 ABOVE: Hotel Negresco in Nice, France. Hotels, like any other commodity, are subject to the rules of supply and demand. The more flexible you are about where to stay (and when to stay), the more money you can expect to save. For lowest rates, use a booking service. Hotel managers know they'll seldom fill all their rooms at the published "rack rates," so they often sell some of their inventory through secure booking services like our hotel partner, Booking.com, which offers guaranteed lowest available rates in all hotel categories. You might be able to match a booking service's rates by showing up at the last minute and negotiating your own price for a vacant room, but you can't count on doing so--and you might not find a room at all. Let the booking service offer an alternative if your first-choice hotel is full. This will save time, and it may save money during periods of high demand. Remember that rooms will be cheaper during low season, whether you book through a service or on your own. 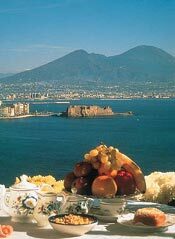 LEFT: A view from the terrace of the Hotel Paradiso in Naples, Italy. Avoid tourist-office booking desks during high season or on weekends. Your hotel choices are limited, and you could find yourself staying in a dump or at an inconvenient location. At busy times (high season and weekends), lines are often long. It can be frustrating to wait in line for a hotel referral when you could be sightseeing or recovering from an overnight flight. How to get the room you want. The quality of hotel rooms can vary, especially in older hotels or in cities where the shape and layout of ancient buildings may limit the number of rooms that have good views and sunlight. Although you can request a specific room ahead of time, you can't always be sure of getting it--and if you've never stayed in the hotel, you may not know what to request in the first place. 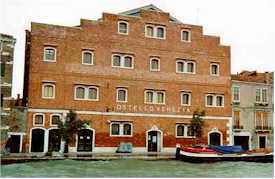 ABOVE: The Generator Hostel Venice (formerly the Ostello Venezia), a hostel on the island of Giudecca in Venice, Italy. If you're on a tight budget, a youth hostel may be worth considering. Many newer hostels have double, triple, or quad rooms instead of the traditional open dormitories, and others (especially privately owned hostels) have done away with onerous rules about check-in times and curfews. Check our city guides for listings. For visits of several days to a week or more, apartment and cottage rentals can save money while offering a taste of local life. Read our article, A Home Away from Home, for more information on self-catering accommodation. Private rooms are a possibility in many countries, where homeowners and farmers supplement their incomes by renting out rooms at modest rates that normally include breakfast. Local tourist offices usually have lists of such informal B&B-style lodgings.